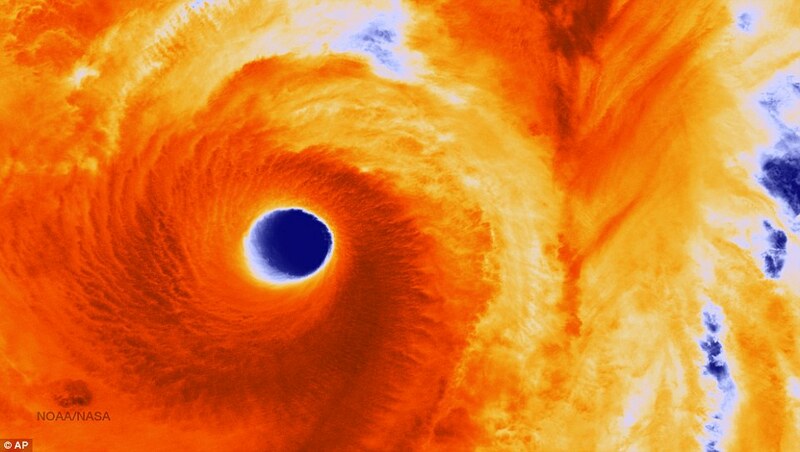 Japan is braced for torrential rain and 120mph winds as Super Typhoon Vongfong sweeps north towards the country's southern islands. The storm, which will be Japan's second typhoon in a week, was moving extremely slowly on Friday afternoon - raising the risk of landslides and flooding when it makes landfall this weekend. 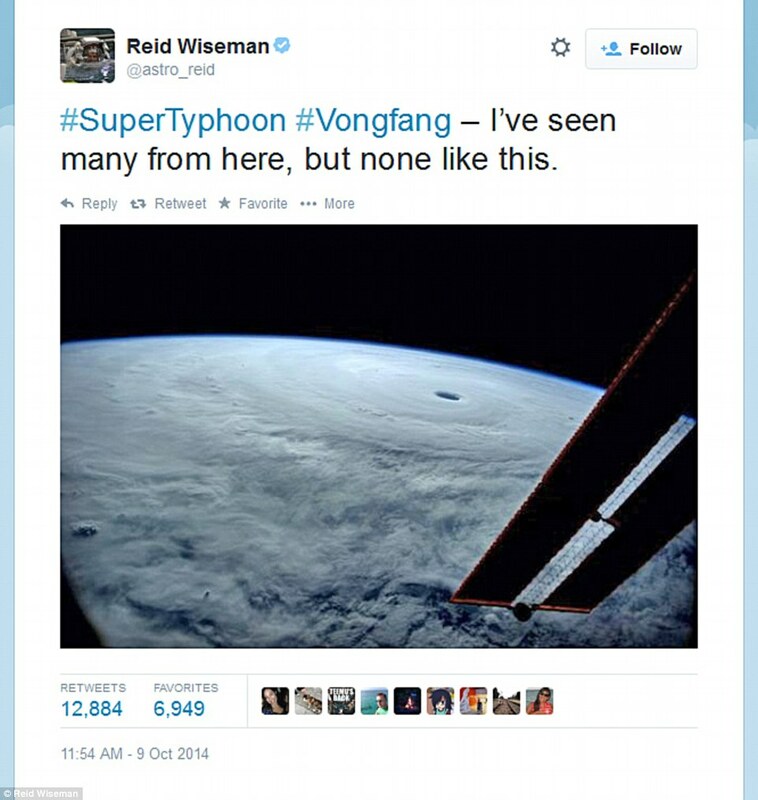 Satellite images taken of Vongfong, which means 'wasp' in Cantonese, suggest that the eye of the hurricane is approximately 50 miles wide. His striking shot shows thick white clouds swirling across the ocean. At one point the typhoon rivalled last year's devastating typhoon Haiyan, one of the strongest tropical cyclones ever recorded, which killed more than 6,000 people in the Philippines alone when it struck in December last year. Vongfong is expected to weaken further as it crosses the open ocean. There have already been reports of waves that are up to 50ft high. 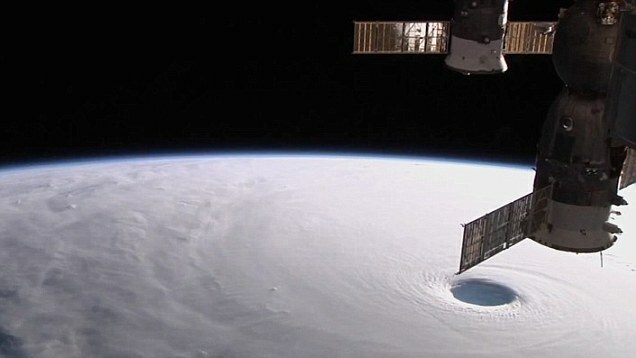 'There is no question that it is an extremely large, extremely powerful typhoon,' an official at Japan's Meteorological Agency (JMA) said. It was likely to be closest to Okinawa, an island chain 1,000 miles southwest of Tokyo, and the home of the largest contingent of U.S. troops in Japan, late on Saturday or early on Sunday. Television broadcast images of residents of Minami Daitojima, an island southeast of Okinawa, boarding up windows ahead of the storm. Government officials were set to meet on Friday night to coordinate their response, Chief Cabinet Secretary Yoshihide Suga told a regular news conference. 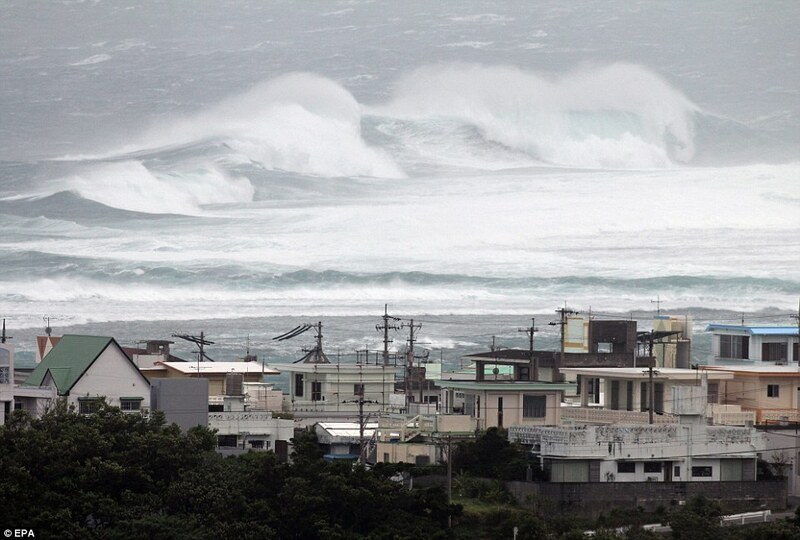 The typhoon was expected to weaken as it moved north, however, and likely to hit land on Sunday on the westernmost main island of Kyushu, before moving northeast towards Japan's largest main island of Honshu, where it is likely to weaken into a tropical storm. Tokyo was set for heavy rain, at the worst. Tropical Storm Risk, which tracks typhoons, labelled Vongfong as a Category 4 typhoon, set to weaken to Category 2 before hitting Kyushu. There are no nuclear plants on Okinawa, but there are two on Kyushu and one on Shikoku island, which borders Kyushu and may be hit. All are currently halted in line with national policy. 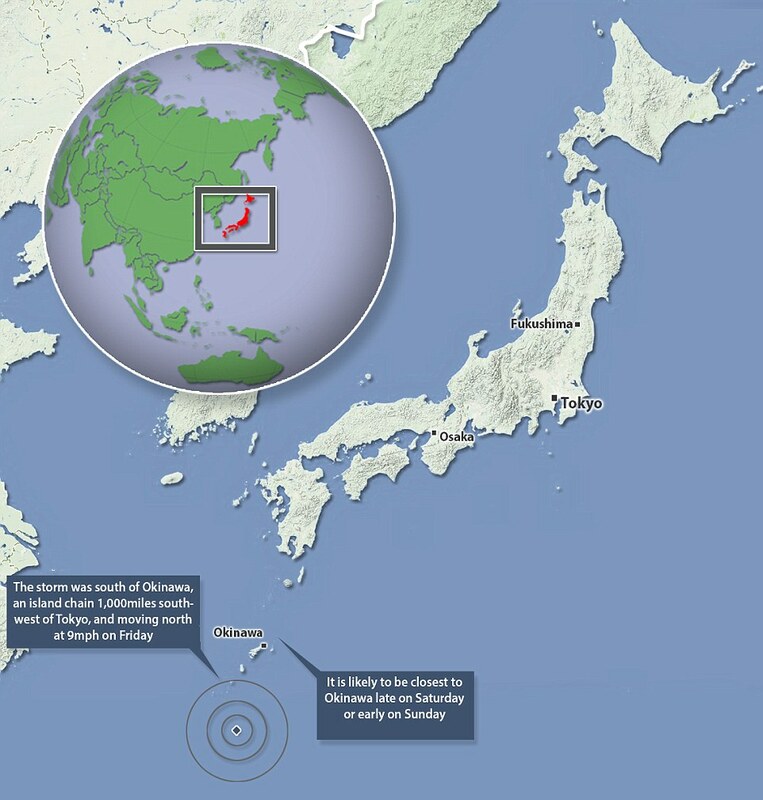 The Fukushima Daiichi nuclear plant, crippled by an earthquake and tsunami in 2011, is on the other side of the country, which is likely to see rain at the worst. 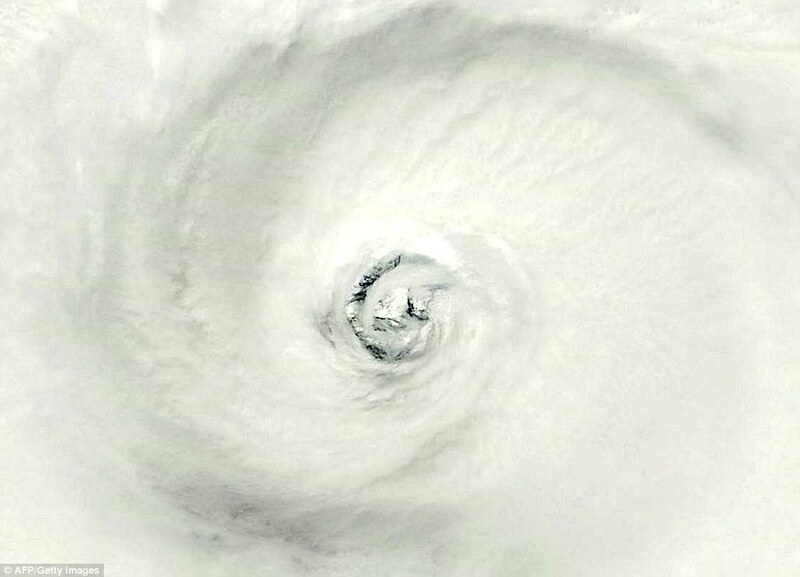 Vongfong is currently following the path of Phanfone, a typhoon that slammed the mainland on Monday, disrupting transport and prompting evacuation advisories for hundreds of thousands of people. Seven people were killed, including three U.S. airmen swept out to sea and a man who died while surfing. 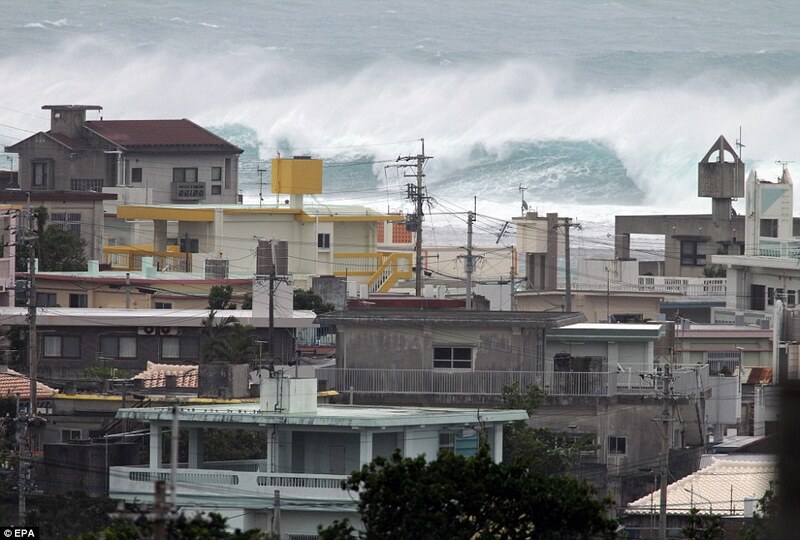 It was unusual for two powerful typhoons to hit Japan in such quick succession, the JMA official said, but added the overall number of such storms had not increased. Governor Andrew M. Cuomo yesterday announced more than $2 million in state grants to implement projects that will better protect communities along the Hudson River estuary from future flooding, storm surges, and rising sea levels. These climate adaptation initiatives are funded by the Environmental Protection Fund and are expected to be complete by the end of the year. The projects, located in coastal and watershed communities, will stabilize shorelines and streams to reduce storm and flood damage to culverts, roads and bridges. The projects are also designed to maintain environmental sustainability and protect water quality and habitat. The Hudson River Climate Resiliency Project is a partnership among the Department of Environmental Conservation’s Hudson River Estuary Program, the Cornell University New York State Water Resources Institute, Cornell University Department of Natural Resources, and the New England Interstate Water Pollution Control Commission. As part of Governor Cuomo’s strategy to enhance state and community preparedness for extreme weather, these projects will advance the Hudson River Estuary Program’s goal to reduce flood-hazard risks, enhance flood resiliency and protect important economic and environmental assets. 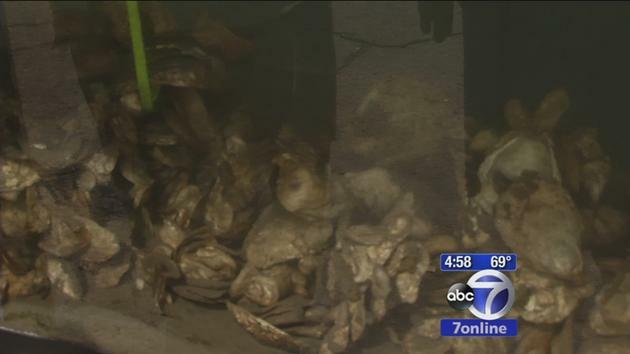 Oysters are thriving in what was the wasteland of the Hudson at Pier 40. Michelle Charlesworth visits the oyster bed hotbed. "We're seeing a population increase. They are growing and growing, and their mortality rates are low," said Chris Anderson, a marine biologist of the River Project. He said oysters are coming back and they are an indicator species. "They indicate the health (of the) ecosystem ... and that means the water is pretty healthy," he said. Anderson SCUBA dives in the Hudson once a week, carefully mapping individual oysters. Last week, he found the biggest oyster he's measured in six years. "If we're finding big oysters, we hope to find other big oysters in the several months to come," he said. The concrete that crumbled from these piers and fell to the bed of the river created the perfect spot for an oyster nursery. It's also great for fisheries, and more fish has meant whales are coming the area to feed. The wildlife conservation society recorded a humpback 6 miles from New York City. Earlier this year, a company called "Plus Pool" announced plans to put swimming pools in the river because the water is as clean as the beaches. Anderson said things are getting better, and although the water is not perfect, the tide has shifted. Industrial facilities dumped more than 5.7 million pounds of toxic chemicals into New York’s waterways in 2010, making the Hudson, Genesee, and Seneca Rivers among the 40 worst in the nation, according to a new report released by Environment New York. Environment New York’s report documents and analyzes the dangerous levels of pollutants discharged to America’s waters by compiling toxic chemical releases reported to the U.S. EPA’s Toxics Release Inventory for 2010, the most recent data available. - The Finch Paper facility in Glens Falls discharged more than 1.4 million pounds of toxic pollution into the Hudson River in 2010, making the Hudson the 24th most polluted river in the country (compared to more than 1,800 rivers and lakes analyzed). - The Genesee and Seneca Rivers are also among the nation’s dirtiest, ranking as the 32nd and 33rd worst in America, respectively. - In 2010, more than 18,000 pounds of cancer-causing toxins were discharged into Lake Champlain. Environment New York’s report summarizes discharges of cancer-causing chemicals, chemicals that persist in the environment, and chemicals with the potential to cause reproductive problems ranging from birth defects to reduced fertility. Among the toxic chemicals discharged by facilities are arsenic, mercury, and benzene. Exposure to these chemicals is linked to cancer, developmental disorders, and reproductive disorders. - Pollution Prevention: Industrial facilities should reduce their toxic discharges to waterways by switching from hazardous chemicals to safer alternatives. - Protect all waters: The Obama administration should finalize guidelines and conduct rulemaking to clarify that the Clean Water Act applies to all of the waterways – including the 45,533 miles of streams in New York– for which jurisdiction under the Clean Water Act has been called into question as a result of two polluter-driven Supreme Court decisions in the last decade. - Tough permitting and enforcement: EPA and state agencies should issue permits with tough, numeric limits for each type of toxic pollution discharged, ratchet down those limits over time, and enforce those limits with credible penalties, not just warning letters. “The bottom line is that New York’s waterways shouldn’t be a polluter’s paradise, they should just be paradise. We need clean water now, and we are counting on the state and federal government to act to protect our health and our environment,” concluded VanLuven. A worker tends to lettuce at Gotham Greens, a commerical greenhouse in Greenpoint, Brooklyn. The bucolic farms of middle America are getting some stiff competition from the rooftops of New York City. A growing number of commercial farms housed several stories high throughout the city are producing crops year-round — in many cases without even using dirt. Several city farms are looking for more rooftop space to grow their local food businesses. And swaths of Queens and Brooklyn with large expanses of industrial rooftops are prime candidates for the urban agriculture expansion. “In dense cities like New York, there isn’t an enormous amount of vacant land,” said New School Professor Nevin Cohen, who specializes in urban agriculture. But “there are thousands of acres of rooftop space in New York City potentially suitable for agriculture — with more than 1,000 acres in Queens,” he said. The Brooklyn Grange, a 40,000-square-foot organic farm that sits on top of the Standard Motor Products building in Long Island City, Queens, plans to open a new rooftop operation each year over the next five years. The group is set to open a 45,000-square-foot farm in the Brooklyn Navy Yard this spring. The farms are also a boon for building owners who can collect rent on previously unused space and reduce energy costs, she said. Farms typically insulate buildings, trapping in heat in the winter and cool air in the summer. Her group is looking for roofs that are at least 30,000 square feet and no higher than 15 stories. The buildings must also be structurally sound enough to support about 1.2 million pounds of soil. Several rooftop greenhouse operations, such as Gotham Greens and BrightFarms, are also looking for elevated space. Gotham Greens, a 15,000-square-foot, hydroponic operation built on a Greenpoint, Brooklyn, manufacturing building, is searching primarily in Queens, Brooklyn and the Bronx. The enclosed farm currently provides a year-round supply of greens and herbs to local restaurants, Fresh Direct and supermarkets, such as Whole Foods Market and D’Agostino. Plants are grown without dirt using nutrient-enriched water. BrightFarms, a Manhattan-based company that builds and runs greenhouses, is particularly interested in sites in Long Island City and Sunset Park, Brooklyn, said spokeswoman Kate Siskel. Viraj Puri, founder and CEO of Gotham Greens, on top of a roof in Jamaica, Queens — one of the locations he had been eying for a rooftop greenhouse. Gotham Greens, in Greenpoint, Brooklyn, grows leafy vegetables and herbs in its hydroponic rooftop greenhouse. “Our goal is to produce food in a way that conserves land, water and the environment,” she said. Seth Bornstein, executive director of the Queens Economic Development Corp., said rooftop farms are a great way to use space and create green jobs. “It’s local produce, it’s better for the environment and it helps us create a sustainable economy,” he said. March 11, 2012 will be the first anniversary of the nuclear catastrophe at Fukushima. As we remember and mourn the terrible human toll of the accident, it is also time to heed the lessons learned from the disaster and to spread the information widely. EMTs, medical personnel, firefighters, police, transportation providers, disaster relief organizations, those responsible for the evacuation of schools, hospitals, nursing homes, prisons and similar institutions are invited to attend "Eyewitness Fukushima: What Emergency Responders Need to Know," a regional conference for First Responders and interested others. We hope you will join us for this important conference and meet Japanese experts who participated in the response to the devastation at Fukushima-Daiichi and a hear panel of American experts who will discuss how the ongoing crisis in Japan relates to disaster planning and response for Entergy's Westchester nuclear facility in Buchanan. The presentation will be followed by a question and answer session. People who live within the 50-mile radius of Indian Point will also be interested in hearing how such a major nuclear accident could impact their community from an emergency responder's perspective. Sited in the most densely populated area of any US nuclear plant, 25 miles north of Manhattan, Indian Point is riddled with safety issues; it is an aging, leaking, deteriorating facility built near the intersection of two earthquake fault lines and a gas pipeline. As it ages and continues to make more and more highly radioactive spent fuel, which must be stored storing on site, it poses a growing threat to public health and safety. This meeting offers an opportunity for First Responders and the public at large to better understand the lessons learned from the Fukushima-Daiichi disaster, how they can be applied here - particularly within the Indian Point 50 mile zone - and to take inventory of our own disaster preparedness and response capability. Click here to view the Eyewitness Fukushima Conference Agenda.Please take a copy to your local firehouse, police and EMT squad and personally invite their participation. Please click here to register.Pre-registration is strongly encouraged; seating is limited to 80 participants. This event is free. Cosponsors: Connie Hogarth Center for Social Action, District Council 37 (DC-37) of the American Federation of State, County and Municipal Employees (AFSCME); Hudson River Sloop Clearwater, Inc.; New York Committee for Occupational Health and Safety (NYCOSH); NYS Psychological Association (pending); Physicians for Social Responsibility, National and NY City Chapter. We hope to see you March 5th at Manhattanville College. 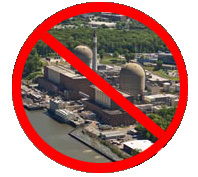 local and county municipal officials to pass the Public Health and Safety Resolution Regarding Indian Point Nuclear Plants. The resolution calls for extending the emergency planning evacuation radius from 10 to 50 miles, addressing the evacuation deficiencies identified in the Witt Report, seriously considering the potential for seismic activity along the two earthquake faults and addressing the safety issues regarding spent fuel storage are critical to public health and safety. Contact Manna Jo Greene Clearwater Environmental Action Director, mannajo@clearwater.org, 845 265-8080, ext 7113 to find out about volunteer opportunities for the Indian Point Campaign. Clearwater Nation! Tell Your Senators to Vote "NO"
Senator Barrasso (R-WY) is asking your senators to vote for a "Dirty Water" amendment that would wipe out pollution limits for America's waters, threatening the health and safety of America's water supply.The U.S. Senate is poised to vote on the Barrasso-Heller Amendment to the Energy and Water Development and Related Agencies Appropriations Act, 2012 (H. R. 2354), perhaps as soon as the week after Thanksgiving holidays. For decades, the Clean Water Act has protected our nation's lakes, rivers, streams, and wetlands from unregulated pollution and destruction. But now these vital protections are seriously threatened. As one of the first and most influential environmental groups in the nation, Clearwater has played an important role in the passage of laws to clean up the nation's waters. In 1972, Pete Seeger and crew sailed the sloop Clearwater to Washington, DC while Congress was debating the Clean Water Act. Seeger personally delivered a petition with hundreds of thousands of signatures to Congress and then proceeded to hold a spontaneous concert in the halls of Congress. This was the turning point that led to the passage of the Clean Water Act. Thanks to the Clean Water Act, our nation's waters are far cleaner today than when the law was passed and are now more fishable, swimmable and drinkable. The Clean Water Act has protected wetlands, so critical to helping filter pollutants and limit flooding and is a landmark piece of legislation for our nation. But the Senate is considering a proposal to permanently block protections ensured by the Clean Water Act. This rider to the fiscal year 2012 Energy and Water Appropriations Bill would permanently block efforts to protect the nation's most fragile waters. The amendment would prevent the Army Corps of Engineers from clarifying the extent to which wetlands and intermittent streams are protected under the Clean Water Act. This pro-polluter amendment could jeopardize many headwater and other critical streams; those kinds of streams benefit more than 117 million Americans, who get at least some of their drinking water from public systems that rely on such streams for all or part of their water supply. Americans across the political spectrum care deeply about clean water. They want more safeguards for their rivers, their beaches and their drinking water, and they know that clean water supports jobs in recreation, tourism and commercial fishing. Unfortunately, various associations representing virtually every industrial source of pollution - including the oil and gas industry, the mining industry, corporate agribusiness, and mega-developers - have vigorously opposed efforts to restore Clean Water Act jurisdiction to these waters. We urge every Senator to stand for the American people and the clean water they deserve, not with big polluters. on the Barrasso-Heller Dirty Water Amendment to H.R. 2354. The Department of Environmental Protection is giving away free rainwater collection barrels to local residents. The water can be used for lawns and gardens, lowering your summer water bill. In the summer, 40% of water usage can be devoted to the garden. Green-thumbed New Yorkers have soaked up a rainwater-collection program with such thirst that the city wants to put even more containers in residents' yards. The Department of Environmental Preservation next month plans to hand out 1,000 barrels that connect to rain gutters and hold up to 55 gallons of water to use on lawns and gardens. The free eco-friendly offerings come after a successful pilot program in 2008 and 2009 that planted 1,000 barrels in Queens. "People really love them," said Carter Strickland, the DEP's deputy commissioner for sustainability. "We did a survey to make sure people were using them and happy with them, and they were," he said. "Almost 90% of people surveyed installed the barrels." Strickland said the collection systems are popular because they save New Yorkers on their water bills. Some 40% of water usage in one- and two-family homes is devoted to gardens during summer months, officials said. "It's an inexpensive way to start making a difference on a small-scale basis," he said, adding the city spends about $80 on each barrel. Anna Manigoult, 75, of Laurelton, Queens, had her husband pick up and install a rain-collection system when the city first gave them away in 2008. "We live on a fixed income so it's really nice," she said. "We connect a hose to the barrel. It came with all the directions, and it is really quite easy." Manigoult, who grows tomatoes, peppers, cucumbers and a small lawn, said she "feels like they grow better with the rainwater. Whether or not that's really true I don't know." Brooklyn: Tomorrow at Marine Park on Avenue U.
Queens: April 30 at Cunningham Park on 196th Place and Union Turnpike. The Bronx: May 7 at Pelham Bay Park's Middletown Road parking lot on Stadium Ave.
Staten Island: May 7 at the College of Staten Island on Victory Blvd. Last updated on April 9, 2011 at 12:12:32 PM EDT. This page provides answers to questions EPA has received about the current nuclear power plant situation in Japan. Has EPA detected elevated radiation levels in the U.S.? What is the difference between the data gathered by the fixed and deployable monitors? What are EPA's radiation air monitoring capabilities? Is this monitoring able to cover the whole U.S.? What are the deployable monitors? What do they measure? When will this data be available to the public? How will EPA share this data? I read about the RadNet system, are these additional units linked into that system or are they different units? Why do I have to log-in to the CDX site to get this information? Where has EPA deployed additional radiation air monitors? How does the EPA monitor radiation if the monitor in my area is temporarily unavailable? Are the levels were seeing in precipitation likely to lead to harmful levels in milk and/or drinking water? Do the levels found in rainwater exceed EPA drinking water MCLs? If so, why shouldn't people be concerned? Why are we beginning to see radioactive material in precipitation on the east coast as well as on the west coast? Will we see these results across the entire country? How often does EPA sample precipitation? Why is EPA sampling precipitation? How often does EPA do drinking water monitoring for radiation? How do I know if my water is impacted by Japanese radiation if there is no RadNet water sampling in my town? Does EPA test milk for radiation contamination? Why is milk sampling important? Why has EPA increased their milk sampling? What is the estimated time for obtaining milk testing results? Is Japan testing for contaminated milk and, if so, what have they found? The data gathered by the fixed monitors and the deployable monitors are different. The fixed monitors send beta gross count rate and gamma gross count rate ranges. The beta gross count rate measures the radiation from all radionuclides that emit beta particles, which is indicated by the term gross or total. The term count rate tells us how quickly beta particles are being detected, which indicates how much radioactivity the monitor is seeing. The gamma data measures radiation from all radionuclides that emit gamma rays and splits them into ranges of energy. The word gross, or total, indicates that the measurement is from all gamma emitting radionuclides. Not all gamma rays have the same amount of energy. Breaking the data into discrete energy ranges helps scientists to determine which radionuclides may be present. The deployable monitors show external exposure rate. The graph shows the external exposure rate data, which is the dose, or amount of radiation, you would receive on the outside of your body if you were standing in that particular location. Background, or normal, radiation levels depend on factors including altitude and the amount of naturally occurring radioactive elements in the soil. Background external exposure rates typically range between 0.005 and 0.020 millirem per hour (mR/hr). Both sets of data provide us with information on the type and amount of radioactive material in the air, and both serve the same purpose: to notify scientists, in near real time, of elevated levels of radiation so they can determine whether protective action is required. At this time, all of our near real time data is showing background radiation levels. EPA's nationwide radiation monitoring system, RadNet, continuously monitors the nation's air and regularly monitors drinking water, milk and precipitation for environmental radiation. The network contains over 100 air monitors across the United States and 40 deployable air monitors that can be sent to take readings anywhere in the country. The near-real-time air monitoring data is continually reviewed by computer, and if the results show a significant increase in radiation levels, EPA laboratory staff is alerted immediately and further reviews the data to ensure accuracy. The system has been used to track radioactive material associated with foreign atmospheric nuclear weapons testing as well as for monitoring foreign nuclear accidents such as Chernobyl. EPA maintains additional monitoring capabilities that can be deployed to any location in the United States or its territories. During the last five years, EPA has been upgrading the nationwide RadNet system by installing new near-real-time radiation air monitors across the country. Currently the RadNet system contains over 100 real-time radiation air monitors in 48 states. EPA also has 40 deployable monitors that can be sent to supplement the system. EPA has 40 deployable radiation air monitors that can be sent anywhere in the United States to gather data. The RadNet deployable monitors have built in weather stations and measure gamma radiation. Like all RadNet radiation air monitors, the RadNet deployable monitors send both weather and gamma radiation readings to EPA's National Air and Radiation Environmental Laboratory, hourly. The near-real-time air monitoring data are continually reviewed by computer and are usually posted to EPA's Central Data Exchange website within 2 hours of arriving at the laboratory. If the results show an abnormality in radiation levels, EPA laboratory staff is alerted immediately and reviews the data to ensure accuracy before posting. EPA's RadNet data is publicly shared at http://www.epa.gov/japan2011/. Daily summaries of RadNet data can be found at http://www.epa.gov/japan2011/data-updates.html. For scientists and technical experts, detailed information on the data sets is still available at http://www.epa.gov/cdx/. The deployable monitors are part of the larger RadNet system. Like the fixed radiation air monitors, the RadNet deployable monitors send radiation air monitoring data to EPA's National Air and Radiation Environmental Laboratory hourly. You do not need to log-in to CDX. In an effort to make EPA's RadNet data more easily accessible and understandable, we have created a webpage with graphs of the monitoring data from across the country. You can access that information at http://epa.gov/japan2011/rert/radnet-data-map.html. Data designed for scientists and technical experts, but available to all, is available through CDX at http://www.epa.gov/cdx. Where has EPA has deployed additional radiation air monitors? EPA maintains additional deployable radiation air monitors that can be sent to any location in the United States or its territories. EPA made the decision to deploy additional monitors to aide us in gathering data from a position closer to Japan. EPA has sent two radiation air monitors to Guam. In an effort to cover the widest possible area, one of those monitors from Guam will be transferred to the Northern Mariana Islands in Saipan. EPA has sent two additional monitors to Hawaii. EPA has sent three additional air radiation monitors to Alaska. The additional monitors will be set up in Dutch Harbor, Nome, and Juneau. EPA's RadNet monitors are highly sophisticated technical devices which occasionally require maintenance and repair. That is why we placed over a hundred monitors across the country - so we would have an abundance of monitors to provide overlapping coverage. If a monitor in one area is being repaired, EPA's network will still be able to detect any fluctuation in background levels. The RadNet air monitors across the U.S. show typical fluctuations in background radiation levels. The levels detected are far below levels of concern. As the Nuclear Regulatory Commission has said, we do not expect to see radiation at harmful levels reaching the U.S. from damaged Japanese nuclear power plants. While short-term events such as these do not raise public health concerns, the U.S. EPA has taken steps to increase the level of monitoring of precipitation, drinking water, and other potential exposure routes. While the levels in the rainwater exceed the applicable Maximum Contaminant Level (MCL) of 3piC/L for drinking water, it is important to note that the corresponding MCL for iodine-131 was calculated based on long-term chronic exposures over the course of a lifetime 70 years. The levels seen in rainwater are expected to be relatively short in duration. EPA is seeing elevated but trace levels of radioactive iodine in precipitation samples analyzed our National Air and Radiation Environmental Laboratory. EPA expects the conditions that allow for long-range air pollution transport to also support the transport of radioactive particles from Asia to North America and across the northern hemisphere. EPA expects the measured levels to be extremely low as this air mass disperses across our planet. EPA scientists routinely tests precipitation samples from more than 30 sites in the U.S. The stations submit precipitation samples to the EPA lab as rainfall, snow or sleet occurs. Under routine circumstances, samples are analyzed by EPA scientists monthly. Since the Japanese nuclear incident, EPA has accelerated routine precipitation sampling efforts. EPA received samples from 18 stations (as of March 21, 2011) and will perform gamma analysis on each sample, followed by the routine analyses. Routine analysis of precipitation for gamma emissions takes about a week from the time the lab receives the sample. This is to ensure the proper analysis and quality assurance (QA) takes place before the results are released. The tests for specific radioactive material may take longer. EPA's RadNet radiation air monitors across the U.S. show typical fluctuations in background radiation levels. The levels detected are far below levels of concern. Sampling precipitation for radioactive contaminants during an emergency is one way to help public health officials ensure that food and water supplies are safe for the public. In the event of a serious nuclear power plant accident, radioactive material may be released into the environment. Some of this radioactive material attaches itself to dust particles in the air and can be carried long distances in the wind. When these particles are caught in precipitation, e.g., rain or snow, they are deposited directly onto the ground. After landing on the ground, they may potentially contaminate drinking water sources and growing food supplies. EPA's RadNet Drinking Water Program obtains quarterly drinking water samples from more than 50 sites across the country. Due to the Japanese nuclear incident, our sampling stations nationwide will collect the samples immediately and send them to our laboratory for analysis. From the time the samples get to the laboratory, it takes approximately three days to complete the analysis. The RadNet radiation monitoring system provides a national network for tracking radiation levels across the country. The system utilizes over 50 drinking water monitoring sites in the United States, and, because radioactive material from Japan will be widely dispersed, reporting from multiple locations throughout the country will show impacts to the nation as a whole. EPA recently announced that we are accelerating our sampling for precipitation, drinking water and milk supplies. Elevated levels of radioactive material in rainwater have been expected as a result of the nuclear incident after the events in Japan since radiation is known to travel in the atmosphere. Short-term elevations such as these do not raise public health concerns and the levels seen in rainwater are expected to be relatively short in duration. It's important to remember that radioactive material from Japan will have to travel thousands of miles through the air before reaching the U.S. The material will be widely dispersed and diluted by wind and weather. As part of our efforts to ensure that there is no public health concern in the U.S. related to radiation exposure, EPA routinely samples cow milk at more than 30 stations every three months. We are accelerating the regularly scheduled sampling for milk throughout the country to provide additional data more quickly in light of the Japan nuclear incident. Sampling milk for radioactive iodine helps ensure that the milk supply is safe for the public by identifying potentially contaminated milk. EPA's existing milk sampling routine would have RadNet operators collect milk samples during the first week in April. Instead, our sampling stations across the nation will collect the samples immediately. This action is precautionary, to make sure that we are gathering as much data as possible in order to inform our scientists and the public. From the time the sample analysis begins, we can have preliminary results within four hours, but a complete analysis can take up to three days. Yes, Japan is testing milk. FDA is coordinating with the Japanese government to ensure products from the affected prefectures do not pose a health risk to U.S. consumers. Please see the FDA website for more informationhttp://www.fda.gov/. The Japanese government has raised the severity of the crisis at the Fukushima Dai-Ichi nuclear plant to 7, the highest level on the International Nuclear Event Scale. Previously, the damage to reactors at the plant, 137 miles north of Tokyo, has been rated at level 5 on the scale, putting it on a par with the Three Mile Island accident in the United States in 1979. The government elevated the disaster by two notches, a rating that has previously only been applied to the Chernobyl accident in 1986. The government's decision is based on a preliminary calculation by the Nuclear Safety Commission of Japan. The safety agency, a government body, estimates the amount of radiation released to be 370,000 terabecquerels. One terabecquerel is a trillion becquerels, the standard measure of radiation. Japan's safety commission, an quasi-independent panel of experts advising the government, estimates the total amount emitted is much higher, at 630,000 terabecquerels. The permissible level of iodine-131 for vegetables and fish is 2,000 becquerels per kilogram. The agency also said radiation beyond the amount considered safe for humans during a full year had been detected up to 37 miles northwest of the plant and 24 miles to the southwest, well beyond the 18-mile exclusion zone the government has imposed around the nuclear plant. The operator of the Fukushima plant also revealed that it fears the radiation being leaked may surpass the amount that escaped into the atmosphere when the Chernobyl plant exploded in 1986. "The radiation leak has not stopped completely and our concern is that it could eventually exceed Chernobyl," an official from the company told reporters in Tokyo. 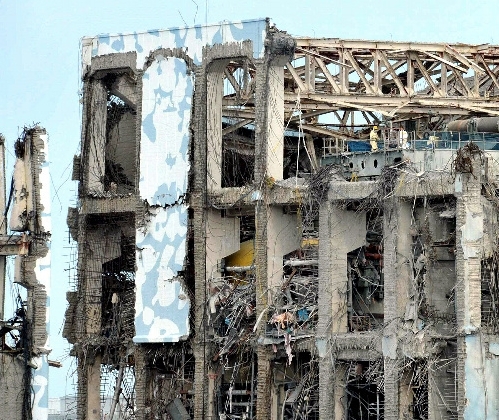 But Japan's Nuclear Safety Agency said radiation emissions from the Fukushima plant, whose cooling system was knocked out by last month's disaster, were so far equal to 10 per cent of the Chernobyl catastrophe. On Monday, the government indicated that it plans to expand the evacuation zone in some areas that are found to have high levels of radiation. The authorities also intend to impose a law banning people from entering the no-go district around the plant to deter residents from returning to their homes to try to salvage their possessions. The latest indication of the severity of the situation at the plant will inevitably cause renewed safety concerns across Japan, which is also still struggling to come to terms with the twin natural disasters that have claimed around 28,000 lives and devastated several hundred miles of coastline in north-east Japan. Earlier, workers discovered a fire close to the Number 4 reactor at the Fukushima plant but quickly extinguished it, according to Tokyo Electric Power Co. The company said the fire was in a battery box and had no affect on radiation levels around the reactor. The facility and much of northern and eastern Japan were jolted in two large aftershocks on Tuesday morning, hard on the heels of a level 7 earthquake on Monday evening. A 5.5 quake shook Nagano Prefecture at 7:26 am, followed by a larger 6.4 tremor shortly after 8am that was felt throughout eastern Japan and made skyscrapers in Tokyo sway.